Sergeant 1st Class Mark Allen of Bravo Company, 48th Brigade Combat Team of the Georgia Army National Guard was critically wounded south of Kabul in Afghanistan on July 8, 2009. He had been in Afghanistan for one month, after serving in Iraq for nearly a year. SFC Allen was engaged in a furious firefight with the enemy when he was struck by sniper fire. The sniper's bullet pierced his armored helmet and passed through the frontal lobe of his brain. 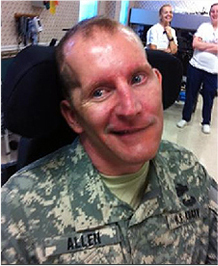 SFC Allen suffered a massive trauma stroke not long after sustaining the gunshot wound. A craniotomy (removing part of his skull) was immediately performed in Afghanistan to relieve pressure on his brain and make room for swelling. He was then transferred to Landstuhl Regional Medical Center in Germany the following morning where another craniotomy was performed to ensure minimal damage from swelling. The majority of his frontal lobe and part of his parietal lobe were removed to save his life. On Sunday, July 12th, he arrived at the National Naval Medical Center in Bethesda, Maryland. Mark is transferred to the James A Haley Veteran's Hospital in Tampa, Florida in August of 2009. He has been rehabilitating there for more than two years. He is unable to talk or walk, and requires 24-hour care. He has limited use of his right hand, but no purposeful movement in any other extremities. Mark is very aware of his surroundings, has retained memories and recognizes his loved ones. He laughs and smiles when something is funny, he cries when he's upset. He is able to follow commands with his right hand, hold objects, use his fingers to indicate numbers, and can correctly nod his head to answer questions most of the time. The Allen family purchased a new home in May 2008, just a year before Mark was injured, in Loganville, Georgia. Mark is married to Shannon, and has two children, a son Cody, and a daughter Journey. Building Homes for Heroes assisted the Allen family with its home modification in Loganville.